OGHS is one of only two hospitals in South Louisiana to offer this Leading Edge Technology! "This system takes surgery beyond the limits of conventional laparoscopic surgery." Opelousas General Health system is pleased to announce the recent acquisition of the da Vinci® Xi™ Surgical System. This system is an innovative robotic system designed to further advance the technology used in minimally invasive surgical procedures. OGHS is one of only two hospitals in South Louisiana to offer this leading edge technology. The first da Vinci Xi robotic case is scheduled for later this month. The da Vinci Xi System is an upgraded, more sophisticated version of the system that OGHS has utilized since 2012. This newer, da Vinci Xi System can be used across a spectrum of minimally invasive surgical procedures and has been optimized for multi-quadrant surgeries in the areas of gynecology, urology, general surgery and more. Because the da Vinci Surgical system is less invasive than “open” surgery, the incisions made are much smaller than conventional surgery. Benefits of this leading edge surgery include a shorter hospital stay, less blood loss, fewer complications, less medication, and a faster overall recovery. 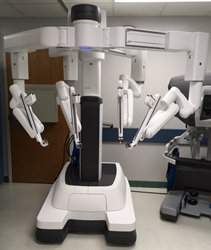 As with all da Vinci Surgical systems, the surgeon is in complete control of the robotic-assisted system, which translates his/her hand movements into smaller, more precise movements of tiny instruments inside the patient’s body. The Xi System’s immersive 3D-HD vision system provides surgeons a highly magnified view, virtually extending their eyes and hands into the patient. The da Vinci Xi System is an expandable technology platform that is designed to accommodate and seamlessly integrate future innovations in areas such as imaging, advanced instruments, and anatomical access. We are truly thrilled to be a leader in this field and look forward to continue bringing residents of Opelousas, St. Landry Parish and surrounding communities minimally invasive surgical options. “The da Vinci Xi System provides leading edge technology for our surgeons to utilize for their appropriate patient. Thus, complementing our goal of delivering the highest level of quality care and best possible outcomes to the patients we serve,” said Kenneth Cochran, President/CEO of OGHS. Eric Amy, M.D. general surgeon said, “This system takes surgery beyond the limits of conventional laparoscopic surgery. It will allow us to provide a multitude of minimally invasive procedures, including, those beyond the scope of general surgery such as: prostatectomy, hysterectomy, myomectomy and more. For more information about the da Vinci Xi System, please contact us at the number above or visit our website at http://www.opelousasgeneral.com.